"You got it, Finn," Oliver says as he encourages his brother to escape out of his crib. Two little brothers have taken the Internet by storm, thanks to a particularly naughty yet adorable moment caught on camera. 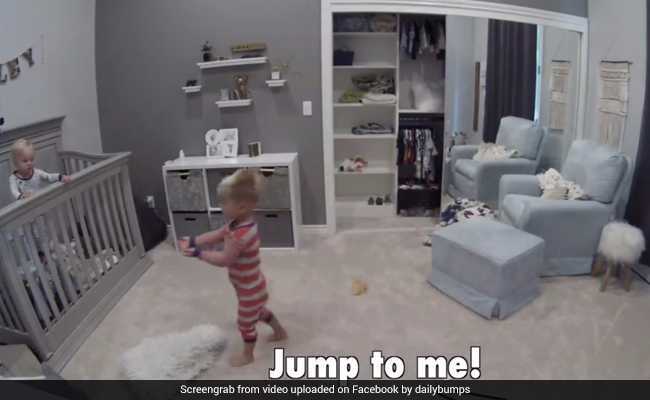 The video shows the older brother, a toddler himself, helping his younger sibling break out of his crib. The little boys prove that just because mommy and daddy say play time is over, it doesn't necessarily have to be that way. Their video has collected a massive 32 million views since being posted on June 6. The video, posted on the Daily Bumps Facebook page, shows Oliver demonstrating for little Finn how he can climb out of his crib. That's not all, he even says words of motivation - "you got it, Finn" so he can accomplish the task. And what's even cuter is how he stands, arms stretched, ready to catch his brother when he makes his escape. We don't want to give the technique away, so we'll just let you watch the video to find out what transpires between the two brothers. All we'll say is that you will be thoroughly impressed with both of them. Along with the millions of views, the video has also collected over 3.6 lakh reactions and more than 3.5 lakh shares on Facebook. People have really been left awestruck by the brothers. "Gotta say! He is an amazing big brother! Aside from helping his brother escape, you gotta love the 'you got this Finn! You can do it Finn!'" says one Facebook user. "Bless Ollie, such a good big brother taking care of Finn. I loved the way Finn looked at the monitor just before he climbed out... such a rebel," says another. Tell us what you think of the video in the comments section below.